STOP 0x0000007B errors are caused by device driver issues (especially those related to hard drive and other storage controllers), viruses, data corruption, and sometimes even hardware failures. 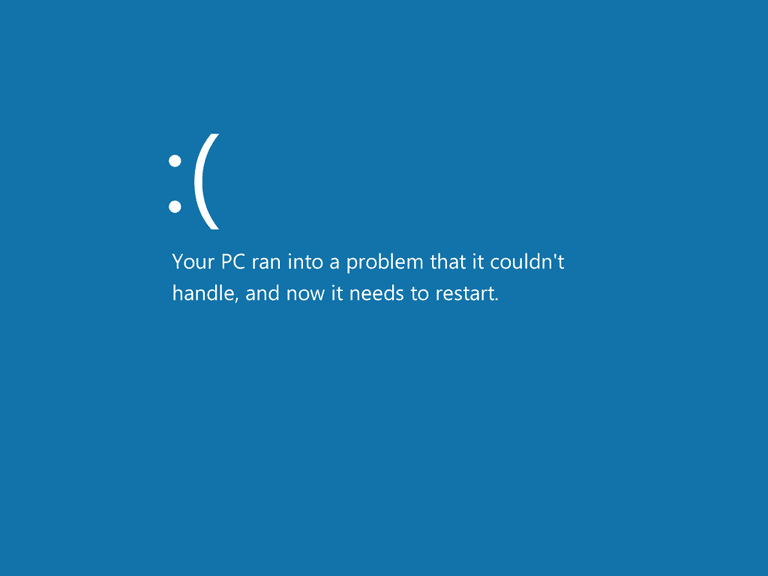 The STOP 0x0000007B error will always appear on a STOP message, more commonly called a Blue Screen of Death (BSOD). The STOP 0x0000007B error may also be abbreviated as STOP 0x7B, but the full STOP code will always be what's displayed on the blue screen STOP message. Any of Microsoft's Windows NT based operating systems could experience the STOP 0x0000007B error. This includes Windows 10, Windows 8, Windows 7, Windows Vista, Windows XP, Windows 2000, and Windows NT. If STOP 0x0000007B isn't the exact STOP code you're seeing or INACCESSIBLE_BOOT_DEVICE isn't the exact message, please check our Complete List of STOP Error Codes and reference the troubleshooting information for the STOP message that you are seeing. Some of these steps may require you to access Windows via Safe Mode. Just skip those steps if that's not possible. Restart your computer if you haven't already done so. The STOP 0x0000007B blue screen error might be a fluke. Did you just install or make a change to a hard drive controller? If so, there's a good chance that the change you made caused the STOP 0x0000007B error. Undo the change and test for the 0x7B blue screen error. Verify that the SCSI chain is correctly terminated, assuming you're using SCSI hard drives in your computer. Incorrect SCSI termination has been known to cause STOP 0x0000007B errors. Most home computers don't utilize SCSI hard drives but instead PATA or SATA. Verify that the hard drive is properly installed. An improperly installed hard drive could cause STOP 0x0000007B errors and other issues. Verify that the hard drive is configured properly in BIOS. The STOP 0x0000007B error could occur if the hard drive settings in BIOS are incorrect. Scan your computer for viruses. Certain malware that infect the master boot record (MBR) or boot sector can cause STOP 0x0000007B errors. Make sure your virus scanning software is updated and configured to scan the MBR and boot sector. See our Best Free Antivirus Software list if you don't already have one. Update the drivers for your hard drive controller. If the drivers to your hard drive controller are outdated, incorrect, or corrupted then the STOP 0x0000007B error will likely occur. If the STOP 0x0000007B error occurs during the Windows setup process and you suspect that the reason is driver related, be sure to install the latest hard drive controller driver from the manufacturer for use during the installation of the operating system. This is a likely solution if the second hexadecimal number after the STOP code is 0xC0000034. Change the SATA mode in BIOS to IDE mode. Disabling some of the advanced features of SATA drives in BIOS could stop the STOP 0x0000007B error from showing up, especially if you're seeing it in Windows XP or during a Windows XP installation. Depending on your BIOS make and version, SATA mode may be referred to as AHCI mode and IDE mode may be referred to as either Legacy, ATA, or Compatibility Mode. While not a common solution, you might also want to try the reverse - see if IDE mode is selected in BIOS and if so, change it to AHCI, especially if you see the STOP 0x0000007B error in Windows 10, Windows 8, Windows 7, or Windows Vista. If you see this STOP error after making the BIOS change on a Windows 7 or Windows Vista computer, you might need to enable the AHCI disk driver. See Microsoft's instructions on making that change in Windows Registry. Run chkdsk on your hard drive. If the boot volume is corrupted, the chkdsk command might repair the corruption. You'll likely have to run chkdsk from the Recovery Console. This will likely be the solution if the second hexadecimal number after the STOP code is 0xC0000032. Perform an extensive test of your hard drive. If your hard drive has a physical problem, one very likely situation is the STOP 0x0000007B error you're seeing. Replace the hard drive if the diagnostics you complete suggest that there is a hardware problem with the drive. Run the fixmbr command to create a new master boot record. A corrupted master boot record might be causing your STOP 0x0000007B error. This will likely be the solution if the second hexadecimal number after the STOP code is 0xC000000E. Clear the CMOS. Sometimes the STOP 0x0000007B error is caused by a BIOS memory issue. Clearing the CMOS could solve that problem. Update your BIOS. In some situations, an outdated BIOS could cause a STOP 0x0000007B error due to incompatibilities with a hard drive controller. Update the hard drive controller's firmware if possible. Just as with the BIOS in the previous step, an incompatibility could be causing the 0x7B error and a firmware update from the manufacturer may correct the problem. Repair your Windows installation. If you've just replaced the motherboard in a computer without reinstalling Windows then this will likely fix your problem. Sometimes a Windows repair will not fix a STOP 0x0000007B error. In those cases, a clean installation of Windows should do the trick. If you haven't just replaced your motherboard, a Windows reinstall probably will not fix your STOP 0x7B issue. Perform basic STOP error troubleshooting. If none of the specific steps above help fix the STOP 0x0000007B error you're seeing, take a look at this general STOP error troubleshooting guide. Since most STOP errors are similarly caused, some of the suggestions might help. Please let me know if you've fixed a blue screen of death with the STOP 0x0000007B STOP code using a method that I don't have above. I'd like to keep this page updated with the most accurate STOP 0x0000007B error troubleshooting information as possible.